Handrail fitted on right hand side for increased safety. For safe standing during repair or assembly work in front of machines and control cabinets. Doing repair or assembly work in front of machines and control cabinets is a challenging career. There can be delicate and detailed tasks that you will have to perform and our mobile aluminium platforms are ideal for safe standing during those jobs. 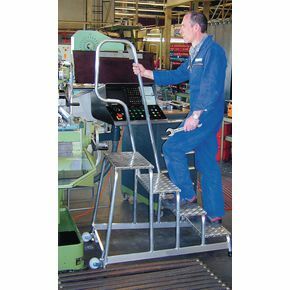 A right-sided handrail gives extra safety to the user, as well as the slip resistant plastic feet and 240mm deep ribbed plate treads, enabling work to be done comfortably and confidently. The back wheels, together with the strong yet lightweight aluminium construction means that the platforms can be moved easily, allowing for flexibility if there are several machines or areas that need high access. Our mobile aluminium platforms are available in three different heights 600, 800 and 1000mm (approximately 24, 32 and 40 inches) - while only being 305mm (12 inches) wide allowing them to easily be stored when not in use. This product is available with FREE UK Delivery.